I’m so happy to share this Chocolate Covered Cherry Cake! It’s from Texas Co-op Power, and it is perfect for Valentine’s Day. It tastes good of course, but it’s also a pleasure to make and has very low margin of error. It’s basically a dump and stir cake, though you will probably want to employ a handheld mixer just to make sure everything is thoroughly blended. 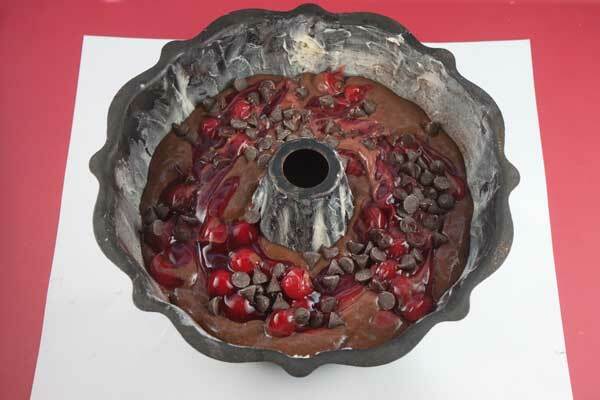 Half a can of cherry pie filling is mixed in with the batter and the other half is spread in a ring in the center. The original version did not include chocolate chips, but I added a few and would do it again. 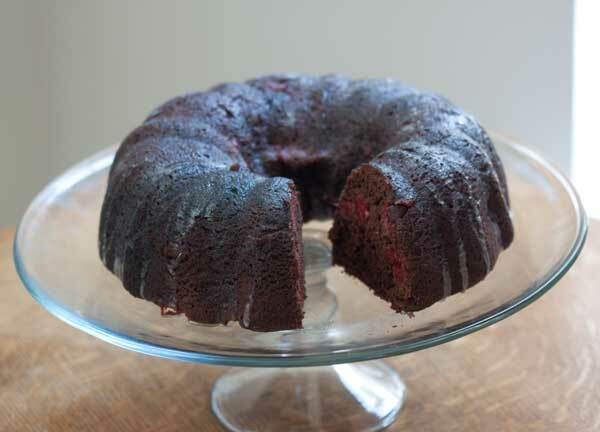 Chocolate Covered Cherry Cake does not have a chocolate glaze, but rather a vanilla glaze that you drizzle on while warm and let sink into the cake. 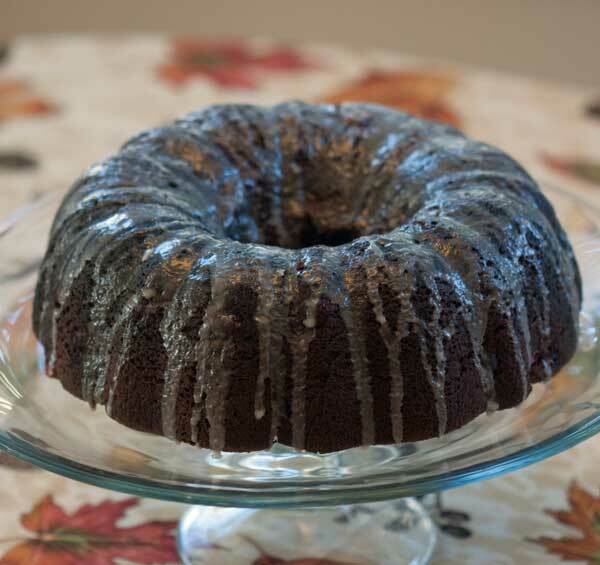 The vanilla glaze adds moisture and flavor, but if you want a more three dimensional cake (or just more chocolate!) you could let the glazed cake cool completely and put a few lines of melted dark chocolate across the top. In addition, you are supposed to garnish the cake with fresh cherries, but I didn’t have any and was simultaneously making our family’s dinner while baking this cake so I left it as is. I did try to take an artsy photo, though. Didn’t work. I need a shorter vase of flowers, more light and probably more commitment to photography. Will try again next time. To store the cake, I put it under a glass dome and am going to see how it holds up at room temperature. Normally I’d shove the cake right in the freezer (well, I’d wrap it first), but I got a glass dome for Christmas and am determined to use it. This is actually the first cake I put under it since I received it back in December. 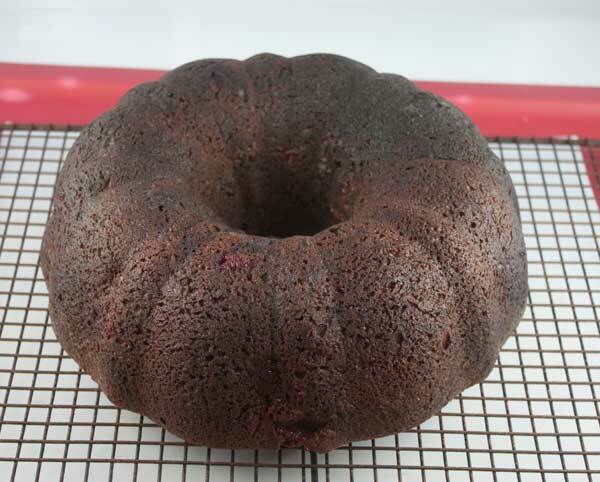 Chocolate Covered Cherry Bundt Cake A simple scratch chocolate cake made with cherry pie filling. 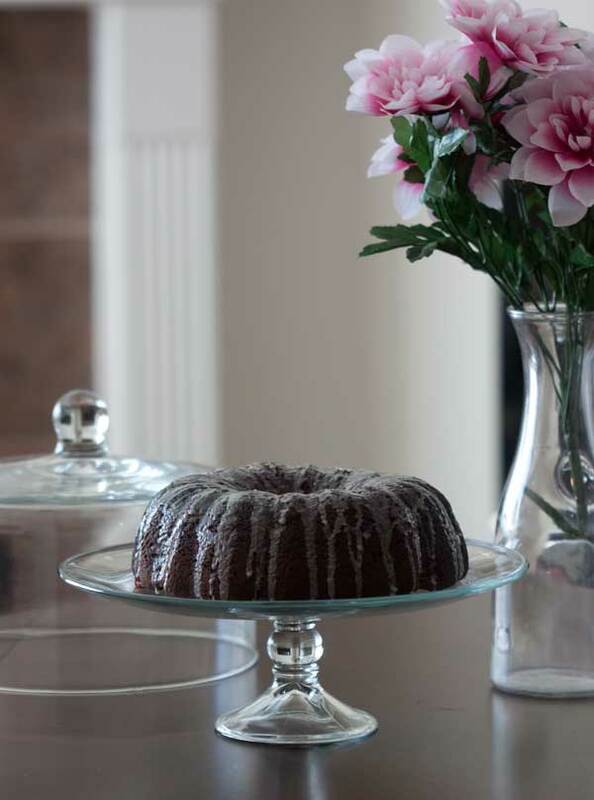 Preheat oven to 375 degrees if using a light, thick, heavy Bundt or 350 if using a black, standard thickness Bundt. Grease the Bundt pan (it should hold 12 cups) with shortening and dust with flour. In a large mixing bowl, mix all the dry ingredients well. Make a well in the center and mix together 1 cup water, eggs, oil, extract and stir until all ingredients are moistened. Beat with a handheld mixer on medium until blended (only about a minute). By hand, stir in half of the cherry pie filling. Pour half of the batter into the pan. Spoon remaining pie filling in a ring around the batter and scatter chocolate chips over it. Keep filling clear of the sides of the pan. Top with remaining batter. Bake 35-40 minutes if using 375 or 45 to 50 minutes if using 350 or until top springs back when touched and cake pulls away from the sides of the pan. Cool on a wire rack for 10 minutes. Remove cake from pan and glaze while still warm. I baked this cake at 350 in a black Bundt pan. It took a little over 45 minutes. A few more notes: This cake doesn't have a lot of oil and gets most of its moisture from the eggs and cherry pie filling. Make sure to use a full 21 ounce can and don't be tempted to substitute canned cherries because you need the sauce from the pie filling. The powdered sugar glaze also adds moisture, so make sure not to skip the glaze. You can go ahead and add a second glaze of chocolate if you want, but don't just skip the first glaze. Thanks so much for the tip on the baking powder. The recipe calls for soda, and since it uses natural cocoa powder (which is acidic), I have always used the soda. I’m definitely going to try it with baking powder as you suggested. Did you change the cocoa powder to Dutch (alkaline) so that it would react with the acidic powder? I’ve made this cake and followed the original recipe except I added 1 tsp of baking powder. (I prefer a little lighter cake). This cake folded out from the pan and looked beautiful even before I glazed it. After the vanilla glaze I did let it cool completely and then drizzled melted chocolate over the top. I shared the cake with a friend who absolutely hates glaze. She LOVED this. I’ve actually done this several times now and is one of my go to cakes it I’m going somewhere that I need to bring something. There are NEVER leftovers. Thank you so much for sharing this recipe. I am going to make this! I got a new bundt pan for Christmas and haven’t used it. I will need to buy a can of cherry pie filling first though. I also think your artsy photo is pretty. I love that recipe! Haven’t made it in a while, but I remember mentioning it at one point and someone saying that the lady who invented the recipe for the Bake-Off lived on her street. It is funny that it’s called “bars” when it’s more of a cake. And I think it uses cake mix. Don’t know if you’ve ever made the old Bake-Off winner Chocolate Cherry Bars, but it’s nice way to combine the two flavors. Not as pretty as the Bundt cake but very easy, and nice and chocolatey with the frosting. It’s called “bars,” maybe because it doesn’t rise as high because of the cherries, but I thought it seemed like a cake. Beautiful photograph of your cake. Bet your family enjoyed the double glaze! Thanks Sue! I took a few more pictures today and will update. On day 2, the glaze sank into the cake more. I actually melted a couple of ounces of chocolate chips with a little coconut oil and drizzled more on top. It’s even better. The cake is very good and definitely perfect for making a day ahead. I am thrilled to see this recipe. A good friend has a recipe with a similar flavor profile. She makes it with a boxed mix and uses a 9×13 pan. I LOVE having a scratch version and all cakes are prettier in a bundt pan! She’s also funny in that she has a very strong opinion about the brand of cherry pie filing. She swears a particular brand has more cherries than another brand. I’ll ask her which is which before I buy. I think your artsy photo is very pretty. Good job!